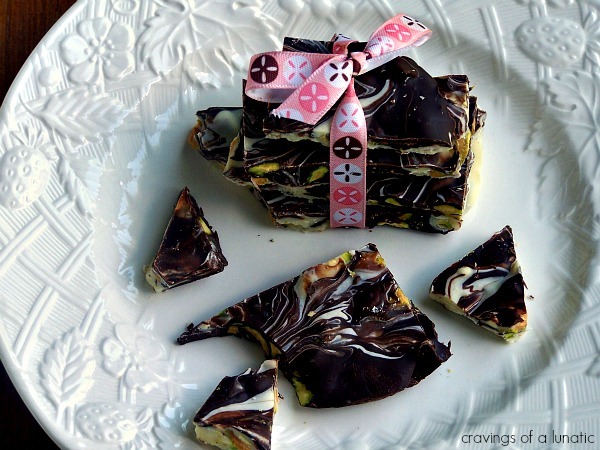 Two kinds of chocolate swirled together to make a marble bark with pistachios in it. Absolutely delicious and easy to make. Hey folks. I am in a huge rush so I am going to make this super quick. I am spending the rest of the day with mini-me. We’re going to see a movie, either Harry Potter or The Help, not sure which one yet. Probably the one we are on time for. That happens a ton, we plan to see one movie, run late then see something else. Hey I can rock it in the kitchen but being on time is not my strong suit. Ask my kids who have spent a great deal of time waiting for me. Or my gf’s who know I am going to be 10 or 15 minutes late to lunch so they just order for me now. I don’t do it to be mean or think I am more important (even though I clearly am), I just always have one more thing I need to do. Or hubs waits to talk to me about something important until just before I try to leave. That happens tons. The kids do it too. The other day I was meeting a gf I hadn’t seen most of the summer and mini-me drops the bomb that she wants to join the army as I go to leave. Yah, I was SO not on time that day. You could hear the “WHAT” across Canada. Not that I am opposed to it. It just means I may have to join with her as I can’t stand the thought of her not being close to me. She either wants to work with horse as a physio therapist (she is at 17 already a certified equine massage therapist, and yes horse get massages, and no they don’t lay on tables for it, although that image is now clearly stuck in my brain, and I am now picturing our horse Ginger laying on a table with a towel over her while mini-me massages her) OR a police officer, but not just any police officer, she wants to specialize and be part of a tactical unit, you know the ones who are danger every second of every day. Okay so that was a run on sentence from hell and clearly I am going to be late if I don’t wrap this up. I am more important than everyone else. Mini-me massages horses and someone with more talent than me needs to draw me a comic of that image. Mini-me has a danger fetish. I am going to be late to an undetermined movie. Yup that seems about right. Moving on. So I made bark last night. I will tell you quickly this stuff reminds me of my father. I had a complicated relationship with my dad. So memories can be bittersweet sometimes. I always bought him Laura Secord’s bark for Christmas. Not the marble, he liked the milk chocolate one. So I thought quite a bit about dad while making it. If you are not a regular reader then you don’t know he passed away 4 years ago from cancer. I took care of him for 8 months while he was sick. I lived about 2 blocks away so it was convenient to run back and forth so I could keep up with the kids and dad. For the last 3 months my wonderful aunt came down to help me. I will write more about this experience one day. There is a post about his last days if you look back to my father’s day post. Anyhow this should not be a bummer post. This is a lovely memory of my dad and how over the moon he was to get it each year. It made him happy which made me happy. That’s what sweets do. They sure can evoke such vivid memories. I think all of us have a memory connected to a fave sweet that reminds us of our folks. Sense of smell has a powerful ability to pull long forgotten memories. They have done studies on this stuff. It’s remarkable how food has such a huge impact on our lives and our memories. So bet you didn’t see that coming? Kim being serious for a minute. Yah, it happens sometimes. Not often but every now and then. Okay I gotta go. Mini-me is giving me the look. You know the one. Dang hairy eyeball I call it. Method 1- Melt in microwave by setting to medium for about 2 to 2 and 1/2 minutes. Glass bowls work well. Method 2- Melt over double boiler separately on stove. I used method 2 but I don’t have double boilers so I just used 2 pots and 2 glass bowls. Takes maybe about 5 minutes. Meanwhile shell your pistachios and break them up a bit. Not too much though. I put mine in a plastic baggie and whacked it with a rolling pin. SO much fun. Add half to each chocolate. Mix. Now pour the chocolate in a parchment lined pan or sheet. Do each separate from one another. Then pull a knife through and create swirls to marble it. Stick in fridge for a couple hours. Serve with melty, chocolatey hands and a big smile. I was just informed the movie starts in 45 minutes. It’s 20 minutes away, so I suppose I should shower. Lol! I shall visit you all tonight. I have lots of return comments to do. Way behind. I am not neglecting you guys, it’s summer so trying to make the most of it. But have set aside a couple hours tonight to blog stalk. Lovely pictures and the recipe sounds delish! Yum, homemade candy, that sounds delicious my kids will love this. thanks! What an easy recipe! Looks so delicious too! Great recipe! I love the added pistachio's! I can't eat chocolate so I really shouldn't comment, I've not eaten it for years and I'm usually fine with it, but these pictures really make me want some… Especially with pistachios. Yum. WOW – this not only looks and sounds DELICIOUS, it's a sweet I can make because it's no bake and EASY! Thanks for the recipe and the process description. This should fix the chocolate craving I'm having this week. I sent this out on my twitter feed. I love pistachios and I also love finding good, no-bake desserts for expats in Korea who live in oven-less, shoe box size apartments. Damn! I love this sooooooo much. Just posted it to my FB wall, subscribing toooooo! @Rita- Thanks. I hope they like it. Mini-me was mad cuz it has white chocolate. Bray did not care. Lol! @Kelly- Thanks doll. I was just drooling over at your blog. @Anne- I lol'd when I read your comment. I even called mini-me in to read it to her. She says if yours is plain chocolate you should post it and adopt her. She was none too happy I ruined ours by adding white chocolate and pistachios. Lol! 17 and still hasn't opened her palate yet. Happy When Not Hungry- Thanks. @Dee- I threw that in just to mess with your head. Lol. @Peas- Lol, I do this with wheat recipes. So I can relate. I stare at them longingly but my tummy forbids it. I broke the rules recently and was punished painfully after. Lesson learned. mjskit- It is so easy. I cannot stop eating this one. Usually I am good, I eat one of something and am satisfied. Not this time. @kitchenarian- I should have but my friends own the theatre so I feel weird about sneaking in food. We saw Harry Potter, was very good. Gonna see the help this weekend. Stunning and your pictures are – once again – beautiful! This looks amazing and I've buzzed it! The pictures are really beautiful, Kim! And the bark sounds really, really yummy 🙂 Great post! @Ann-Thank you so much. I had fun with this one. And eating it. Lol. @The Harried Cook- I am so touched you tagged me. Accept and will post about it for sure. Thank you so much. This is what I need for my chocolate cravings. Chocolate and pistachios. Perfection. Yummy! Kim Bee, this looks so good (and so easy to make!). 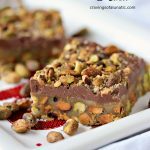 Pistachios and chocolate – what an immortal combination! Oh I love bark! This looks amazing I love the pistachio in it too. Oh wow Kim, those bars are just perfect..I love your combination and the way you made them..they really sound and look incredibly tasty! I hope you had fun! haha this is a great post! i love it, especially the part about mimi-me's dang hairy eyeball. 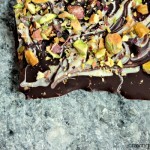 plus the bark looks amazing and is making me super hungry for some chocolate & pistachios! Have fun at the movie! Whichever one you see. 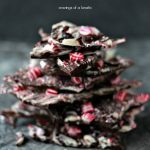 Love the bark – simple but delicious! 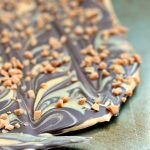 Yummy bark! Great post. Have fun at the movies. Hope you enjoyed your movie! This bark looks so pretty! Great colors, and sounds wonderful with the pistachios! Looks so awsm and love the swirl design you gave. I am saving this recipe for Christmas! Congrats on making top 9!! Looks so delicious! @Dzoli- Lol, I hope you do try it. So easy and good. I do have a habit of rushing and things work out. What is odd is that when I try to plan ahead or over think it then it does not turn out. Same with writing for the blog. I think I do better under pressure. @Pretend Chef- Will cure your craving quickly. So easy and fast to make. @Tori- Thanks so much. I make a bunny cake for my kids that I hope they remember one day. He has a bow tie and everything. So fun.Thanks for the kind words and for featuring this on your picks. I was stunned and thrilled. I am so sorry about your Grandma. Cancer is just a vicious disease. Thank goodness for loving memories. I want to see pics of you make this my dear. I bet you could do it some serious justice. @Andrea- Lol, I think that image is burned into everyone's brain now. I went to the barn yesterday and took one look at our horse and died laughing. @Sandra- Had a great day. Thanks so much. I really liked doing this one. @Lizzy- Thanks. I aim to please…and giggle. Stop by again. Nice having you. @Lacy- Honestly mini-me is hilarious and she has no idea how much she inspires giggles. She refuses to pose for pics for the blog so I write about her for revenge. Roflmao! @Carolyn- Thanks. Ended up seeing Harry Potter but going to splurge and see The Help tomorrow. Lol! @Erin- Had a blast. Thanks so much. This stuff is wicked when you are trying to behave yourself. I can't stop eating it. @Claudia- Thanks so much. I am embracing my inner photographer. Lol! @Kankana- Thanks, the swirl is key. Makes it taste better. @Molly- Thanks so much. I am thinking it's not a phase. She wants to be a tactical police officer so apparently danger is her middle name. I don't recall that on her birth certificate though. Lol! 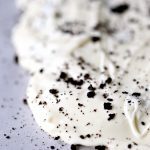 @The Procrastobaker- I adore you name! SO catchy. Thanks for stopping by. @Eliotseats- Good plan. Would make great gifts. @Kate- Thanks so much! I was floored. Did not expect it. Does that bark ship well? Can you mail me some? 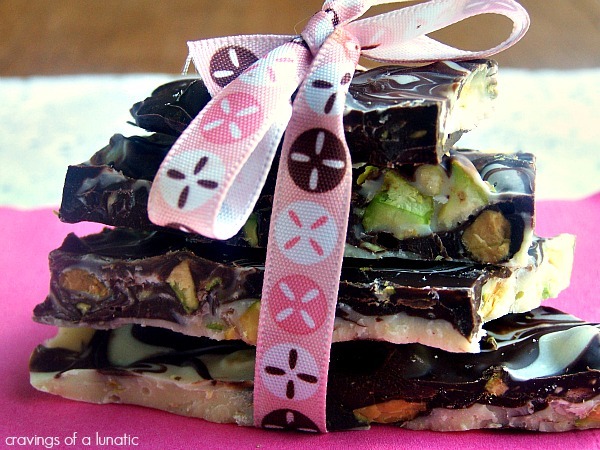 I love that stuff, chocolate AND pistachios… heaven! Way, way, WAY behind on my blog posting! I came here to tell you congrats on making Top 9 and then I saw that you have several other posts AND you were selected for Tori's weekly picks?! OMG! You are a rock star! Congratulations…it's been a GREAT week! @Jenelle- Lol, I am sure it does. @Ann- Lol, busy week. Thanks so much. 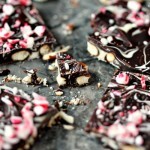 my oh my, i must make this tomorrow, having serious chocolate craving reading your post! YUM!!!!! DO I POUR THE 2 CHOCOLATES ON TOP OF EACH OTHER OR NEXT TO EACH OTHER BEFORE MARBLING? Hi Danielle. I did them side by side before marbling. Some people do it on top but I find it doesn't work as well for me personally. So I just drop about 4 bunches of each chocolate randomly around then slide the knife around. Hope that helps. @Guilietta- Thanks. You should rush right into your kitchen and make these girl! @Shannon- Hope you did make it. So good. Oh yum, Kim, this looks delicious. I am just ack from vacation and glad to see such a yummy treat from you in my stumbles! Pistachios and chocolate! You can't go wrong. Simply wonderful.